The primary purpose of this article is to make the process of having design work professionally printed a bit more transparent. As a graphic designer doing a decent amount of identity design work, I find it very important to have a relationship with a decent print shop. I maintain a roster of independent cultural clients who do interesting, engaging work and whose companies are low-impact environmentally. No direct mail campaigns, no massive amounts of useless print advertising, and no direct-to-rubbish bin gimmickry. I am choosy about what I design, and when it comes time to getting a project printed, I strive to do so in the most ecologically healthy way possible. Yet, almost every time I collaborate with a new client, they are stumped about how the print production process works. 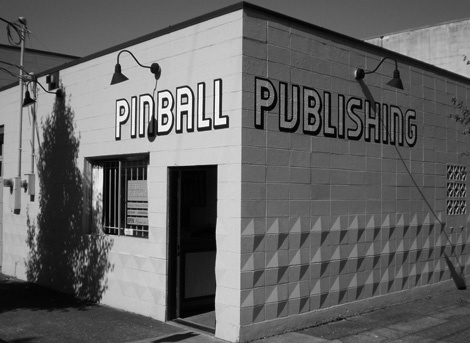 I’ve had a really great working relationship with a small printing business in Portland, Oregon called Pinball Publishing for a number of years now, practically since their inception. I really love working with them due to their strident regard for the environment, as well as another important fact: they pay their workers a living wage. (You can’t say that about most printers in China, unfortunately. And while shipping work there may be cheap, the ecologic and environmental footprint is vast.) I choose to send my clients to rad folks who do great work and who pay their employees enough so that they aren’t living on macaroni and cheese. Who makes up the Pinball team? The Pinball team is comprised of Laura Whipple, Director of Operations; Austin Whipple, Creative Director; Ashley Edwards, Project Manager; Jess Hirsch, Project Coordinator; Nicholas Graham, Production Manager, and Brent Wick, Production Specialist. 1. 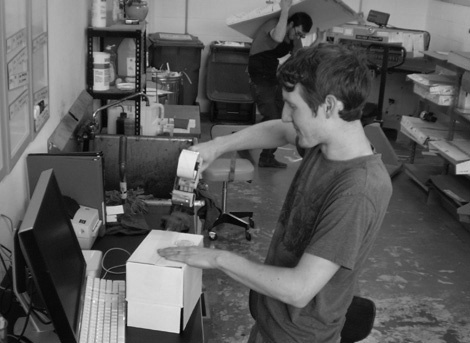 Design-sensitive, sustainably-minded printing facilities are few-and-far-between. 2. The personal service and understanding of a project were all but missing. 3. The enthusiasm for the magic of printing had vanished. We took this as a challenge to provide custom offset print options with a focus on understanding our clients’ vision in an enthusiastic, design-sensitive environment where both novices and professionals can purchase the highest level of quality with the best service in the industry. How did you become interested in printing? 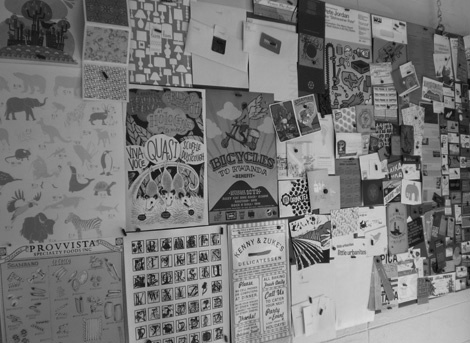 Printing is the most widely distributed form of media. From Bibles to candy wrappers, its endless variation is something that has always inspired our creativity. The simplest application of ink on paper can result in the most profound emotions, whether it’s selling underwear or the afterlife. 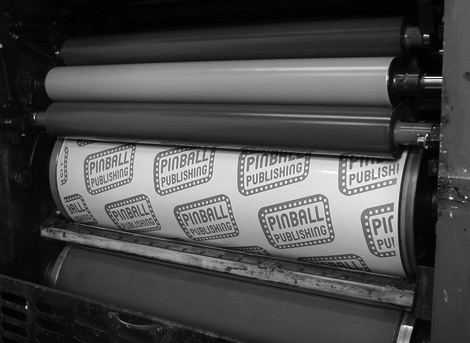 It’s this infatuation with the communicative power of print that led us to Pinball. Unlike many print shops, Pinball Publishing was founded not as a business, but as a solution to a problem we feel many designers face: How do I successfully translate my design into a physical reality? We knew that being more deeply involved in the printing process would be the key to making our own projects more effective — both technically and creatively — and that this was a service we could offer to many others through our printing. 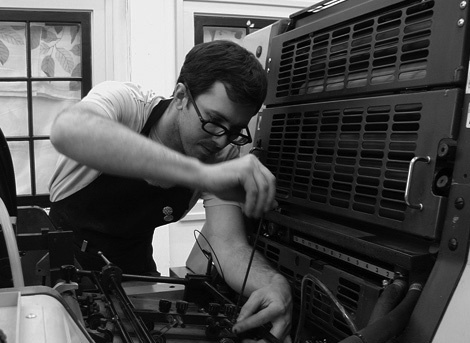 How did you make the transition to becoming a working print shop? We knew that investing in printing equipment for the sole purpose of satisfying our own personal print fetish would not be a sustainable enterprise. We began formulating print solutions from Day #1 and have not stopped growing in either quality, capacity, and diversity since then. 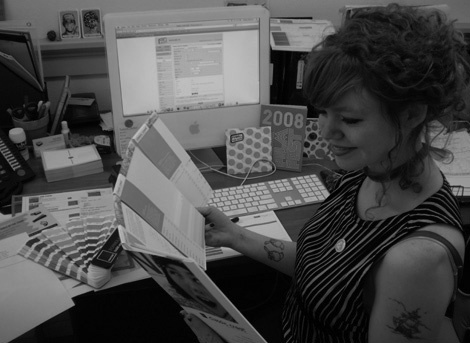 We specialize in custom offset printing — that means we emphasis spot color printing over 4-color process printing. 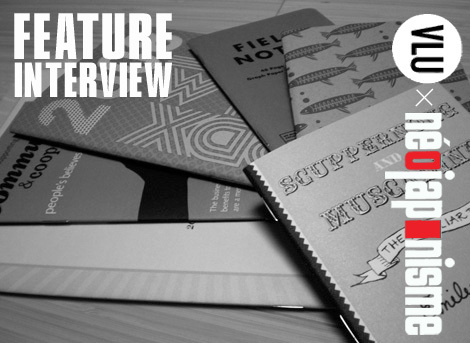 We offer a wide range of fun print items, with a focus on creative booklet options. 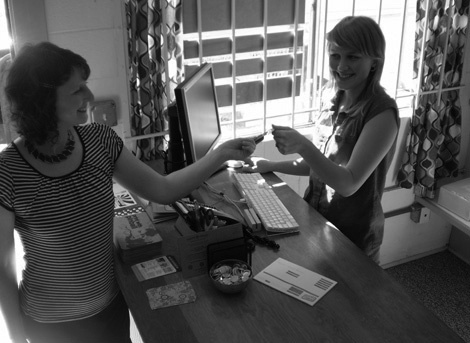 We are also a “green” shop with a specially picked selection of in-house/stocked recycled papers and soy-based inks. Can you break down the printing process for us step-by-step? We’ve composed an illustrated life cycle of a Pinball Print Job to help explain our process. A potential Pinball print client contacts us for a quote, either in person or by phone, e-mail, or a custom quote form submitted through our website. We aim to contact the client within 24 hours with a quote, or if necessary, with further questions about their quote request to make sure we have all of the correct specifications and nitty-gritty details before we generate pricing for the client. During this stage, the client provides print-ready artwork and a 50% deposit. The project details and shipping instructions will be confirmed with the client, and then the project officially moves into the pre-press zone, where the files are digitally prepared for printing. Our pre-press staff will verify that the document size, ink colors, type, and image quality are correctly set for offset printing. If necessary, we may contact the client for revisions to the files, or further clarification. We always provide a PDF proof to the client before we go to press. This is when the magic happens! After receiving proof approval from the client, we move the project into production. 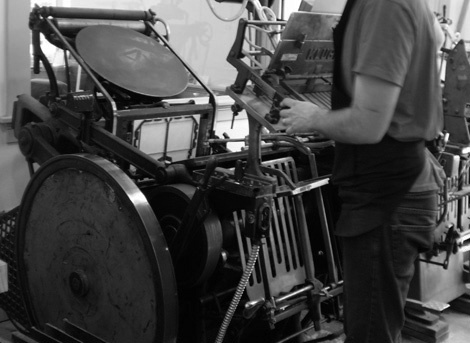 The appropriate papers and inks are ordered, the plates are output, and the project makes its way onto one of our three presses, depending on the specifications (size, number of inks, registration, and so on). Most projects are completed within 5 to 10 business days, although more custom, labor-intensive projects may take up to 2 to 3 weeks. All projects require some type of finishing. Many only need to be trimmed to size after they have been printed, but we have a variety of other finishing options, such as custom die-cutting, scoring, folding, envelope conversion, hand assembly, and a number of bindery methods, including saddle-stitching, perfect binding, and wire-o binding. After everything is packaged, in-town clients can either pick up their projects or have them delivered by bike messenger for a small fee. All other projects are shipped via UPS. You have an in-house stationery line, Tenth & Grant. How did that come about? Tenth & Grant was born out of our desire to produce a retail line of paper goods that combined our design sensibility, production know-how, eco-friendly ways, and collaborative friendships with talented artists around the world. We’re excited to see the line grow this year after our attendance at the National Stationery Show in NYC. You guys have a commitment to printing in environmentally sound ways. How does Pinball offer more eco-friendly options than other printers? Since we opened our doors in 2002 and began offering eco-friendly print options, we’ve seen many print shops turn “green.” Offering recycled papers, soy-based inks, low VOC press room chemicals, direct-to-plate technology, and purchasing green power have become the norm for many print shops. We take a more comprehensive approach so that when someone purchases printing from us they know that it’s not just their particular print job that’s using recycled paper and other eco-friendly options, but that the entire shop is run with high environmental standards. It’s a top-down approach that we implemented because of our own desire to be good to our world and ourselves. How are soy inks different than regular inks? What we might consider to be regular inks are made with a petroleum base, the same oily substance that is pumped from the ground and refined into gasoline. It’s a nasty product with high Volatile Organic Compounds that are bad to work around and that contribute to the depletion of the ozone layer and global warming. It is also not a renewable resource. New formulas of inks have been manufactured with soy or vegetable oils to reduce the VOCs and control the supply by growing crops that can provide the oil. Our inks are milled locally using soy oil that has the added benefit of printing brighter colors due to it’s natural clarity. You also have a record label. What is the story behind that? We offer alternative, paper-based media packaging that has allowed us to meet many talented musicians. It’s one of our pleasures to pair the printing we offer with the many talents of our incredible clientele. We just recently began releasing music titles under the name Bangback Records. We are working on our second release, a CD titled Gungle Dungn by the duo doubledutch. What is the hardest print job you guys have done? Hard is relative. We approach every print job with the same dedication to a quality finished product. Even what appears to be the simplest print job can pose serious production challenges. Any favorite designers/collaborators you enjoy working with? Our Creative Resource Center includes many of the designers and artists who we work with on a regular basis. Our favorite clients represent a combination of creative skill and a collaborative spirit. These two elements paired with Pinball’s printing make for exceptional outcomes. What does the upcoming year have in store for Pinball? We’re expanding into a new production space next to our current HQ. We’ve recently attended the National Stationery Show with our paper goods line Tenth & Grant. We’re overhauling the website and releasing our second Bangback CD, just to name a few! What are some of your favorite projects that you’ve printed? Many of our favorite print projects are featured on our print blog, CoinOp. Why Pinball PUBLISHING and not Pinball PRINTING? The term “Publishing” represented to us a bigger goal than just “Printing.” We wanted to be a tool for releasing a message by making it public via printing. Printing was the tool, publishing was the act. While it’s business in the front, there’s a party in the back. We don’t ever want to forget that we’re in it because we enjoy it. If we ever stop having fun, we’ll close our doors. And besides, what’s more fun than Pinball? !